Autumn is here, time to get muddy! Yeap, the clocks have changed, and the weather is cooler- it’s prefect MTB riding! What about getting out and joining us on one of our MTB events? We have had a really busy last few months, with trips toNew Zealand, Mount Buller and the Flinders Ranges, as well as continuing our day trips in Adelaide. Check out the photos, videos and links below! Now we turn our attention to more events for the Autumn and Winter- more skills courses (including at the new DENR Craigburn Farm trails), and we are off to Melrose for the Fat Tyre Festival. Oh, and did we mention we will be off to France again, for our 4th Annual Alpine Epic?! Couple of spots left if you are keen! So, give us a yell if you fancy joining us sometime. As long as it is on a MTB, we are up for it! It’s still not too late to join us this July! Yeap, we are off to the Alps again, it’s going to be another ripper trip. Think 2 weeks of riding some of the best trails in Europe, throw in the occasional chairlift to help with the climbing, and end every day in pure luxury in our wonderful Alpine Chalet. 3 Course meals, wine and more! It really is the BEST way to experence the Alps! For more info, photos and vids from previous trips, click ‘ere! Never made it to the FTF? Are you mad?! If you have never made it to the Fat Tyre Festival over the June Long weekend (8-11 June), then you really should! It’s one of our favourite events, loads of riding, heaps of fun events, some Escapegoat skills sessions, and a lot of partying! Really, what else could you do? For more info check outthe OTE website….. Fancy improving your riding? Well, we can help! For more info and bookings check here! We have been superbusy with the cameras over the last month! There’s a heap of new photos to see from our trips to NZ and the Flinders. Plus we have started to trawl through all our video footage to put some vids together- check out the awesome footage from the Bike Buller Brake Burner or from our NZ trip. We’ll add more videos to ourYoutube channel as we finish them! Want to keep up-to-date with everything we do at Escapegoat? Well, make sure you ‘like’ us on Facebook or Follow us on Twitter- we are much better at posting updates on social media than we are sending emails! Expect regular updates, photos, videos and more…..
Don’t worry, we are still running our day tours too- suitable for all! 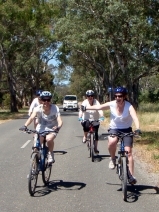 So, why not join us sometime for our Hills, vines and wines tour and explore the trails of Kuitpo, then moving on to the wines, beers and local produce of McLaren Vale– bike really is the best way to explore this region! Or try our special roll down Mt Lofty. Yes, we are still the only operator allowed to access Cleland Conservation Park on bike. It’s a lovely ride, and a great introduction to mountain biking. It’s also super popular with overseas visitors! There’s still time to sign up to the BikeSA and SAMBA Dirty Weekend! We are still pondering which catergories to sign up for, but rest assure the event will be great- the track is again being designed by the South Australian MTB Association, so even if the weather is not great, the track will be! Hope to see you there! Can we pursuade Deborah to do a lap again this year so we classify as a mixed team!? OK, so it wasn’t all riding in NZ- we also got a chance to hook up with the guys at NZO and visit their shed. They gave us a great welcome, and the guys grabbed a fair bit of the NZO gear at a discount rate. Now we just LOVE NZO stuff- their shorts are about the best you can get, and basically the only ones we wear. Follow us on Facebook at we will send out a discount code soon so you can get stuff cheap too! We have also now been lucky enough to get them to design a new Escapegoat Tour top. It is based on their daytona top but is designed for us, with a list of all our trips for 2012. Everyone on our NZ and Alps trips will get one free! They sell their tops for $89, but we also have a few spares we are happy to sell for $65 each. email us if you want one!